Check out today's pricing and retail availability for El Molinet. 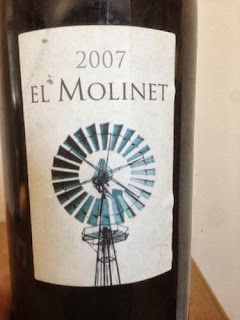 Original tasting and review : This is El Molinet, Spain, 2007, finished at a fairly whopping 14.5% alcohol. In the glass: Deep blood red, opaque in the center. On the nose: Poured at room temperature and swirled vigorously, shows a bright magenta fruit - like purple trumpets and trombones. From the aroma, seems like this will be a fairly unique experience. On the palate: The primary elements on the palate are in fact raisined and sleek bold fruit, with plenty of acids still in play to keep this lively six years after its vintage date. In summary: Overall, rates an easy three stars on the five-star Spirit of Wine scale. Best value.